You're doing fantastic! By now, you have your storyline mapped out on your Blake Snyder beat sheet. And you have them arranged on index cards so you can actually see your story playing out. Is there anything better than that? Now it’s time to make sure that every story beat gets its energy from what's called the protagonist’s “third rail”. The third rail gives your novel its power, propelling the reader ever forward through your story from the first word to the last. What is the “third rail” you ask? The third rail is the epic internal struggle between your protagonist’s most desired goal, and her longstanding misbelief. Your job as a writer is to make sure you lay down your heroine’s third rail through every page of your novel. Otherwise, your story will stop cold on the tracks, causing your reader to stop reading. You don’t want that. Conceptually, laying the third rail is an easy process. You simply create conflict in every chapter that challenges your protagonist’s longstanding misbelief. But it’s actually a little bit more involved than that. Why? Because this is the part where you must dig down to the essence of what’s really going on in your heroine’s head and heart. Allow me to introduce an important part of the Story Genius method to taking a closer look at each of your story’s beats. In, Story Genius, Lisa Cron’s second book, she and her novelist partner Jennie Nash developed an incredible method of focusing on the most important elements of each scene, or chapter, in a novel. They developed a tool called the “scene card” to keep track of such elements. I call this valuable tool the “scene worksheet”. Why? Because there are a lot of things that you, as a writer, need to keep track of in each of your scenes. You will gather more information than you can capture on just a card. Every scene and chapter you write for your novel must ride on your protagonist’s third rail. If even one chapter doesn’t ride on the third rail, your entire novel will come to a screeching halt. The name “scene worksheet” just seems more appropriate. You’ll see why in just a moment. 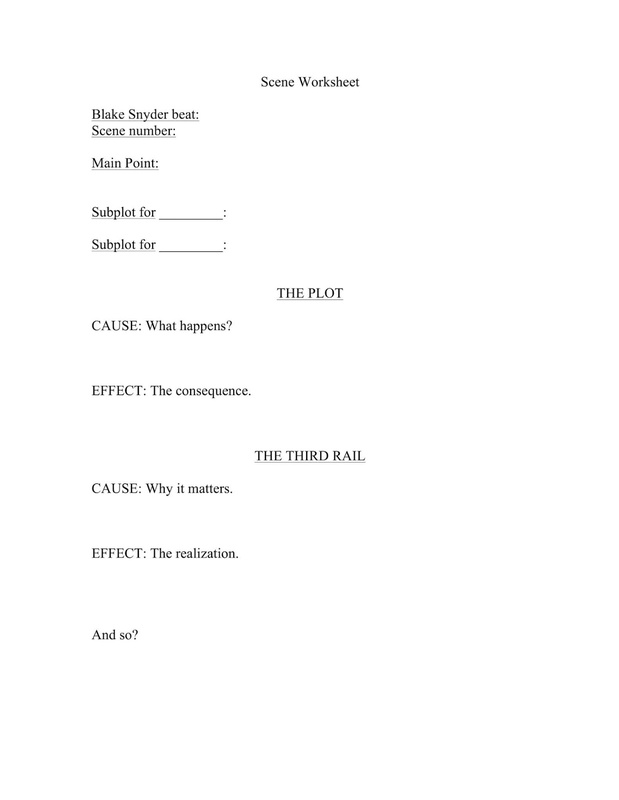 Let’s take a look at what a scene worksheet looks like. Using my example as a guide, you write down the Blake Snyder beat, the scene number and the main point of the scene in the “Main Point” space. This would be the primary plot event that takes place, and the main action the protagonist takes during the scene. You'll also notice two spaces marked “Subplot”. This is where you write down the plot points of the other major characters in this scene. Remember: each character has their own personal agenda that they are working to carry out. They each have their own “third rail”. And you must keep track of every character's agenda. The nice thing is, if you created your other major characters correctly, each of the other characters’ goals, and the achievement of such goals will ultimately have a significant impact on your protagonist, and the achievement of her goals. Here’s an important thing to keep in mind: Every other character’s internal struggle should intensify the protagonist’s internal struggle, forcing her to confront and overcome her longstanding misbelief once and for all. In the next section, there are places where you make more notes about the plot points in each scene, the causes and effects of each character’s actions, and the third rail element of each scene. Here is where you track how the events in the scene affect your protagonist internally. In “The Plot” section under “Cause”, is the question “What happens?” is listed. Under “Effect”, is “The Consequence”. In “The Third Rail” section, the items, “Why it matters” under “Cause” and “The Realization” under “Effect” are also listed. 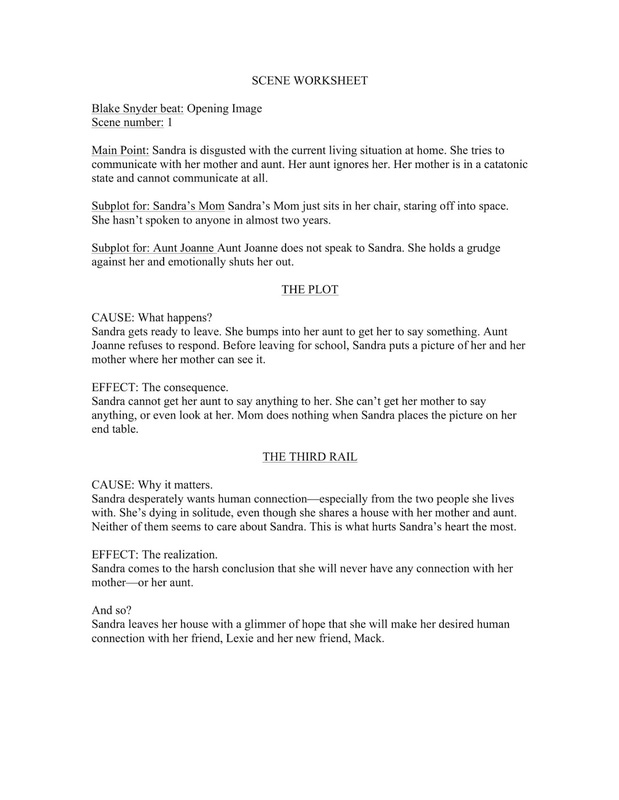 For a visual example, take a look at a completed scene worksheet for my young adult novel From Bad Girl To Worse. The notes I made on this worksheet should be self-explanatory. The main thing to note is that you only need to write a one or two sentence note for each item and question. Don’t try to cram too much information in any of the sections. If you do, your scene will quickly become confusing. Your scene worksheet will wind up hindering you instead of helping you. And that will defeat the whole purpose of drafting it. 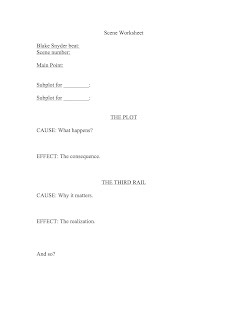 It's critical to master using the scene worksheet for each scene of your novel. By mastering this valuable document, you'll have a much better time tracking your protagonist’s internal transformation throughout the story. After all, that’s what story is all about--the internal change of your heroine. P. S. – Always remember the progression of cause and effect. If, then, therefore…action, reaction, decision. Apply this rhythm to the progression of your protagonist’s internal change.